The Boston Police Department officially concluded their body worn camera pilot program, a year-long trial requiring 100 Boston police officers to wear body cameras while on active duty on Tuesday, according to a BPD press release. 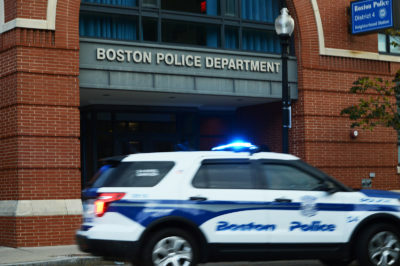 The cameras captured over 4,400 hours of footage, more than 33,000 separate incidents of BPD Officers interacting with citizens and an average of 96 videos per day, according to preliminary numbers included in the release. The treatment analysis, complete cost-benefit analysis and writing of the report is set to be finalized in June of next year, according to the release. Segun Idowu, lead organizer for the Boston Police Camera Action Team, said having police-worn body cameras would have been invaluable during the infamous Ferguson, Missouri case of 2014, in which 18-year-old Michael Brown was shot and killed by officer Darren Wilson. Idowu said the process of beginning the trial was complicated but that he is hopeful the results will lead to the permanent implementation of body cameras on law enforcement. The body camera pilot program was initially intended to last only six months, with full implementation set to follow soon thereafter, but the BPD extended the program by another six months in March, citing the need for more time for data collection and analysis, The Daily Free Press reported. Rahsaan Hall, the director of the Racial Justice Program for the American Civil Liberties Union of Massachusetts, wrote in an email that he hopes the BPD will cooperate to implement a permanent program to better monitor police work in the city. “We urge the police department to work with the Boston Police Camera Action Team and other community-based organizations that are trying to bring more accountability to a department that has targeted Black people in nearly 70% of its street encounters with civilians,” Hall wrote. Body cameras can lead to a safer Boston, Hall wrote, thanks to efforts made by citizens in pushing for the pilot program’s implementation. Several Boston residents said they agree the body camera program should become a constant within the city’s police department. Caitlin Fischer, 35, of Brighton, said the police need to be observed just as citizens are observed by police. Matthew Decker, 44, of Allston, said implementing body cameras would improve the city of Boston. Tracy Rich, 60, of Jamaica Plain, said body cameras should have been worn before now.